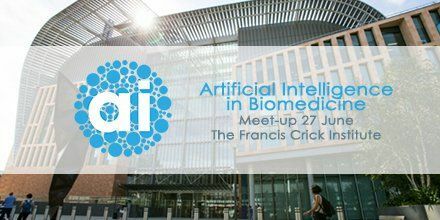 On 27 June, the 2nd event in the BenevolentAI seminar series welcomed a range of multidisciplinary attendees to the impressive, newly opened Francis Crick Institute in Kings Cross. Emma Norris, Research Associate at the Human Behaviour-Change Project (HBCP), presented a poster and heard two expert speakers present examples of their work in using Artificial Intelligence (AI) to generate increased insight in the fields of biomedicine and healthcare. First, Markus Ralser (Group Leader, Francis Crick Institute) outlined his use of machine learning to speed up research into metabolism. His team uses quantitative mass spectrometry to investigate regulatory functions of the metabolic network, with machine learning guiding and analysing these processes. Secondly, Jane Reed (Head of Life Science at Linguamatics) summarised her company’s use of Natural Language Processing (NLP) to interpret biomedical and healthcare data. They analyse various healthcare documents such as patient records, doctor’s notes and scientific literature, using NLP to ‘find the needle in the hay stack’: the information of key interest to a given client. The HBCP poster presentation highlighted the team’s progress in organising the fragmented evidence base produced by behaviour change research. The poster summarised the current state of play in the development of the Behaviour Change Intervention Ontology (BCIO). It also outlined the system architecture for the project: how the ontology will be used to frame annotations of existing behaviour change scientific literature, to train machine learning systems and generate new insights with artificial intelligence in collaboration with IBM Research, Dublin. The event generated interesting discussion between attendees from machine learning, data science, biomedical and behaviour change backgrounds, across business, start-up and academic sectors. Follow this link to see the HBCP poster that Emma presented.